Last year's garlic harvest was extremely healthy and produced many truly magnificent bulbs. The very best of the harvest went back into the ground last October-November. We grow primarily hardneck garlic, which has a generally superior flavor, appearance, and medicinal potency. 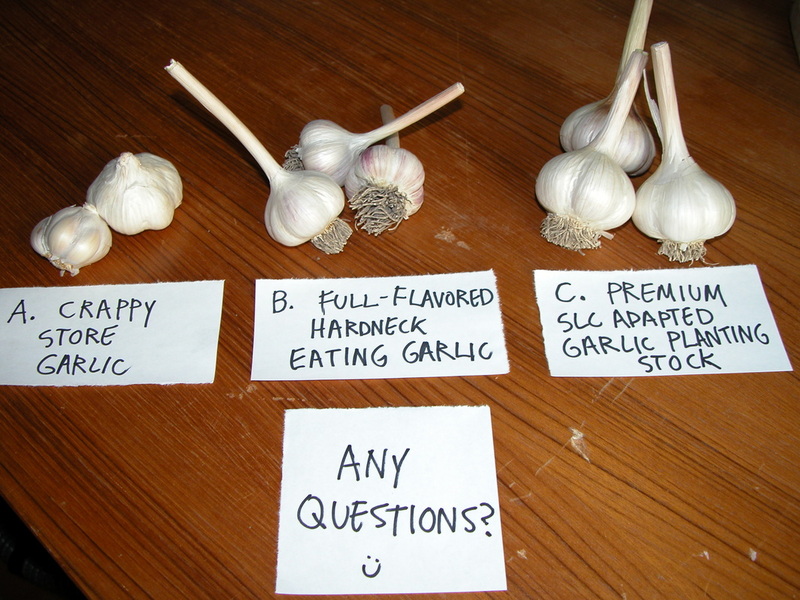 However we also offer the oldest North American garlic strain Inchelium Red, a softneck, as well as Elephant Garlic. Our truly premium garlic is the result of many years of carefully selecting only the healthiest and most vigorous garlic strains and individual plants for replanting. We plant each fall and harvest each summer in accordance with the biodynamic calendar. We inoculate our cloves at planting time with beneficial mycorrhizae so that our garlic is in tune with powerful energies both from within the soil itself and from the cosmos at large. We add generous additions of compost and aerated compost teas to the soil, and foliar feed regularly in the spring with kelp and fish hydrolase. Add to this many many hundreds of additional encouraging thoughts / words / dreams directed toward the garlic over the course of each season, and you can hopefully see that our garlic is the product of immense love and careful attention to detail. From July - October we will have premium culinary grade garlic available while supplies last for $14 a pound, available at our farmer's market stand (see the 'Find Us' tab above) or by mail order. Please email keepitrealvegetables@gmail.com for garlic inquiries July through October. We usually sell out quickly, so remember that midsummer (July + August) is the best time to get your garlic planting stock set aside for the fall!